Good evening! 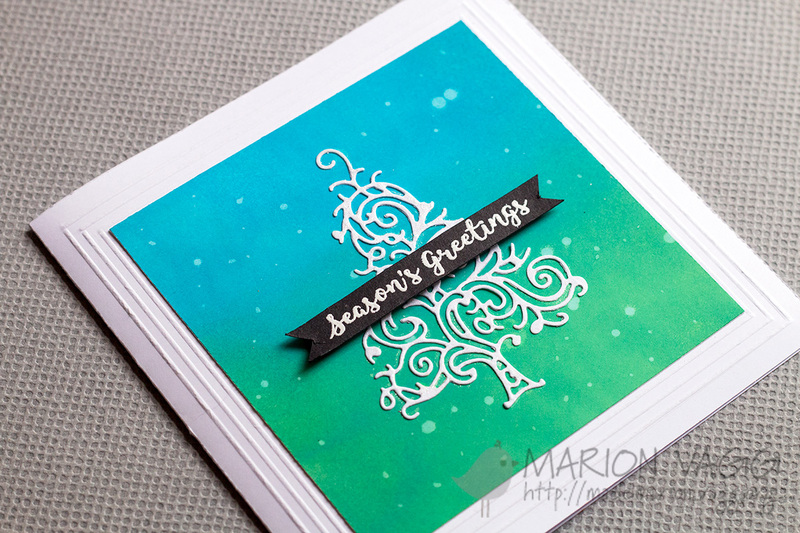 Today I have a card to share using some Penny Black products. I stamped the images onto the focal panel from the Penny Black Tiny Treasures stamp set and coloured the whole panel in with Copic markers. 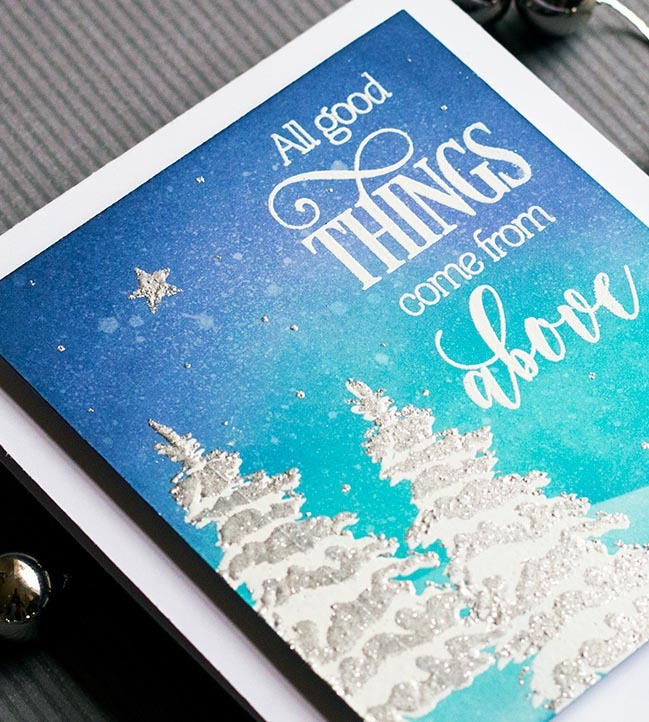 The sentiment was white heat embossed onto a strip of black card stock and is from the Penny Black Holiday Snippets stamp set. I added some pearlised Nuvo drops for some additional details. Hi! 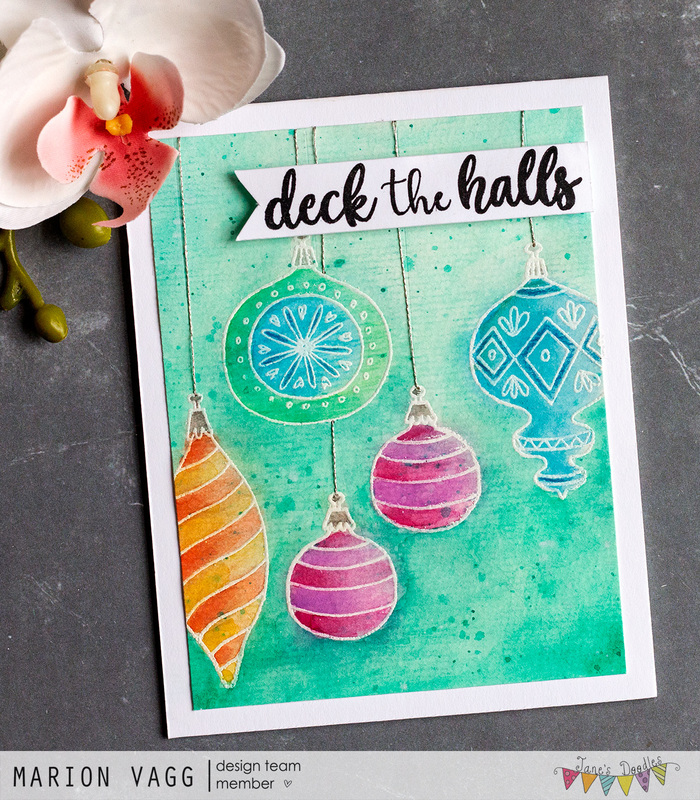 I’m back with another Jane’s Doodles card using a gorgeous stamp set called Deck the Halls. I am doing well – I think this is my second Christmas card I’ve made and it’s only October! I pulled out a cheap set of watercolour paints for this one. Lots of layers and heat setting between layers. I thought I had ruined this on many occasions, but watercolours are very forgiving and somehow I kept adding and ended up with this! I sewed on some silver thread for something different. 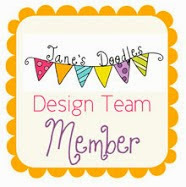 Head on over to the Jane’s Doodles blog for more awesome inspiration. I have a simple Christmas card to share with you today. 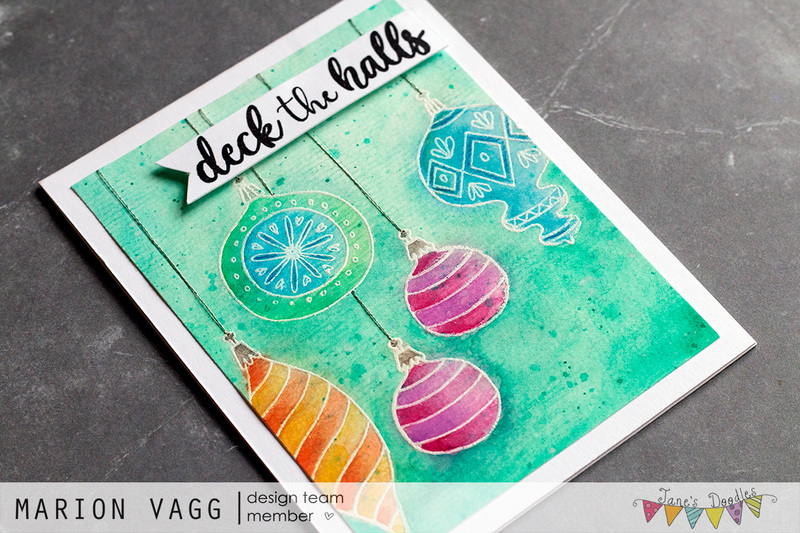 It uses my two favourite crafty items – Distress Oxide inks and die cuts. I blended in some Lucky Clover and Salty Ocean Distress Oxide ink onto some Bristol smooth white card stock. I flicked on some water droplets to create the snow effect, which I dabbed off with a paper towel. I then die cut the Penny Black Swirl Tree from white card stock and adhered it onto the inked panel. Before adhering to the card base, I created some score lines with a stylus and score board to create a decorative border. The sentiment is from the Penny Black Banner Sentiments stamp set. 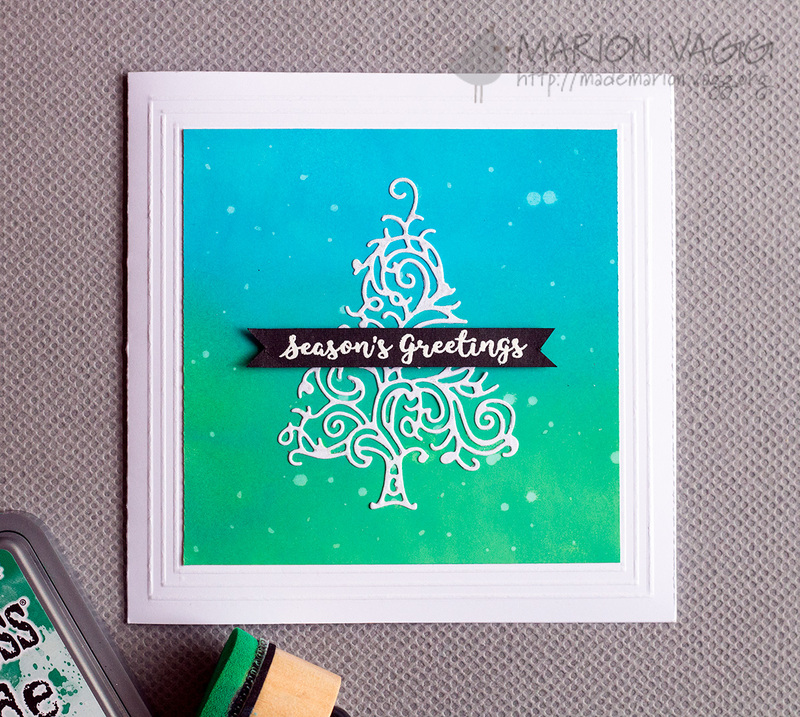 It’s a bit hard to tell, but the tree die cut has some shimmer thanks to a clear Wink of Stella glitter brush pen. Hello! I hope your week is going well – and a Happy Thanksgiving to all those who are celebrating. 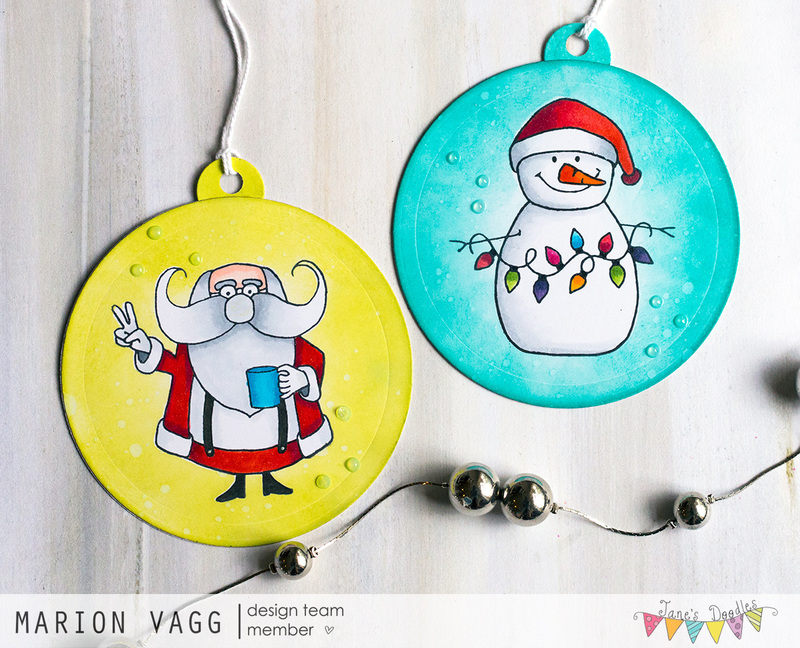 I have two cute Christmas tags to share with you today using Jane’s Doodles Mr & Mrs Claus and Warm Wishes stamp sets. I have been on the lookout for a simple round bauble/tag die, so in the meantime I made my own using some circle dies. If anyone has a good suggestion, let me know. Anyway, I stamped the Santa and snowman and masked them with some masking paper. I blended on some Distress Oxide ink (Peacock Feathers and Twisted Citron) then spritzed with water. After removing the masks, I coloured with Copic markers. It’s hard to tell in the photos but the red areas have some shimmer from a clear Wink of Stella glitter brush pen. I finished them off with some Nuvo Jewel drops. 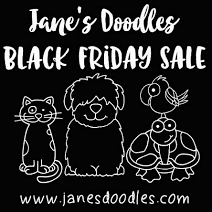 And don’t forget that Jane’s Doodles is having a sale at the moment – 30% off all stamps! What are you waiting for? And in other news….I finished my school reports today! Yay!! I had this card posted over on the Jane’s Doodles blog last week and I forgot to post it here! 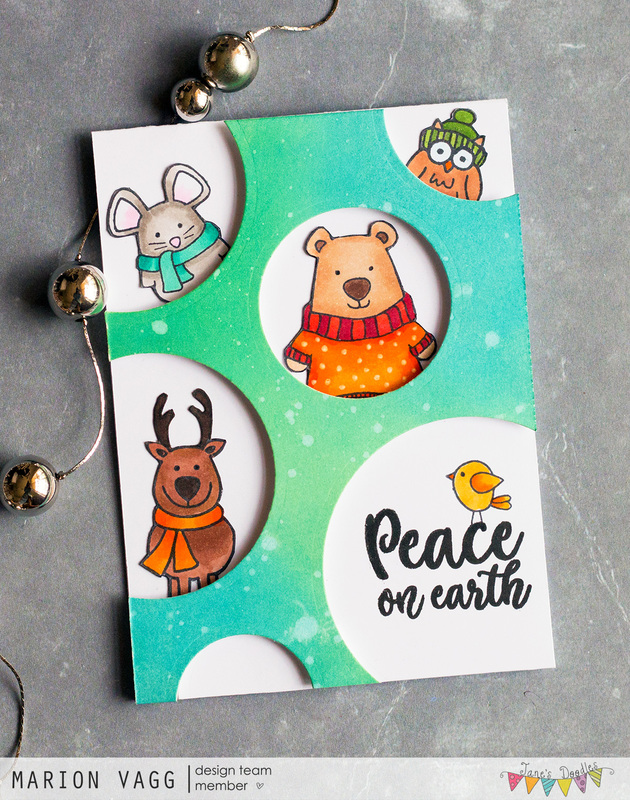 A fun little Christmas card using a few of Jane’s adorable critters. 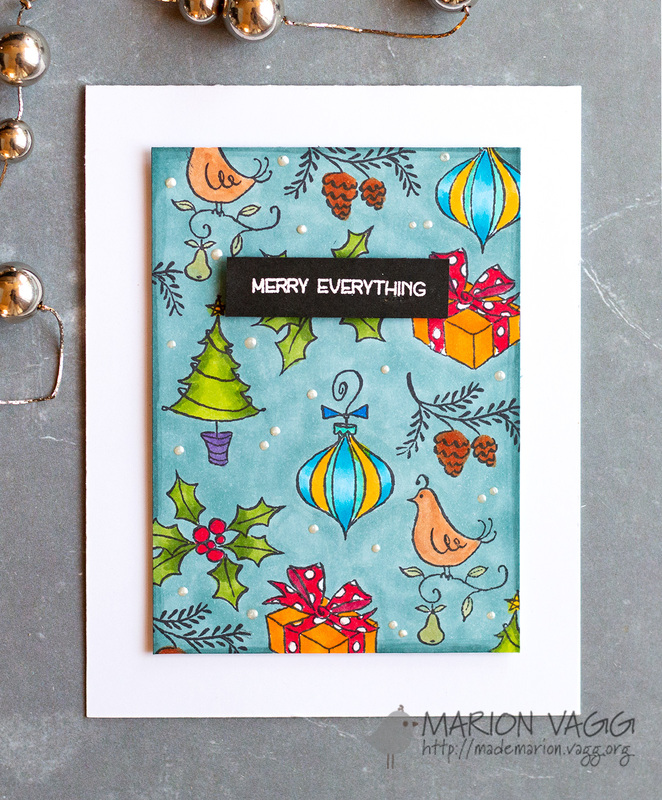 I used three of Jane’s sets – Merry Christmas, Winter Fun and Winter Wishes. I blended in some Distress Oxide inks onto the front panel (Cracked Pistachio and Broken China), then spritzed it with water. I used several circle dies to cut out the holes for the critters. I stamped and fussy cut out the critters, coloured then with Copics and adhered them onto the card base. The front panel was popped up with some foam tape. I hope you are having a fabulous week. I’m on the home straight of writing my school reports. Yay! The end of the school year is fast approaching and there are lots of things to do and be done.